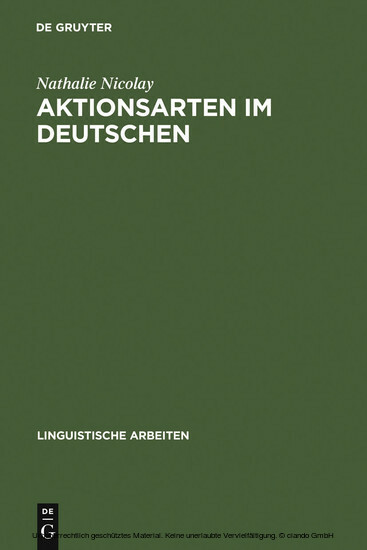 The study proposes a comprehensive classification of action types in German. It revolves crucially around the distinction of three classes of state verbs. Actional features relate to the temporal structure of the denotation expressed by the verb. Unlike aspectual distinctions, they are shown to be part of the semantics of the verbs in question. The investigation of actional features takes account of word-formation-morphological and syntactic regularities as well as pragmatic factors, drawing upon a broad range of examples to do so. Widely held but fallacious assumptions on the relationship between action type and grammar (e.g. the formation of the perfect, the passive) are corrected.